Access All Areas! 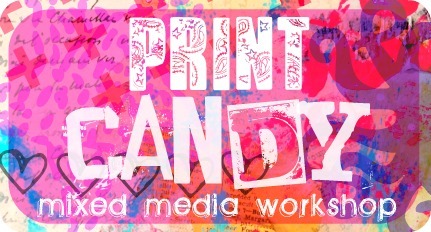 PRINT CANDY is now available. This Workshop is the place where you will learn to create fabulous unique printed artwork the 'Art Eye Candy' way. In PRINT CANDY we will explore using mixed media PRINTING techniques to create FABULOUS PRINTED PAPERS, COLOGRAPHS, MONO-PRINTS, SCREEN PRINTING, TRANSFER PRINTS and LINO CUTS. Explore different ways to use your Gelli Plate, create your own stencils and make fantastic unique works of art following step-by-step instructions. 15 Inspiration Candy videos to get your ideas flowing. suitable for ALL levels of artistic ability - what you create will be at your own individual skill level, all sessions can be extended for more complex results. Once you sign up, you will be added to the student list for the class and sent a Welcome email, including equipment/supplies list approx a week before class opens. Then, on the eve of class, you will be sent another email with the class address and your password.